Crunch, crunch, crunch—we have reached a place of relative quiet amidst the chaos and clamor of the Kumbh Mela, and I can hear the gentle sound of my sandals against the raw dirt. 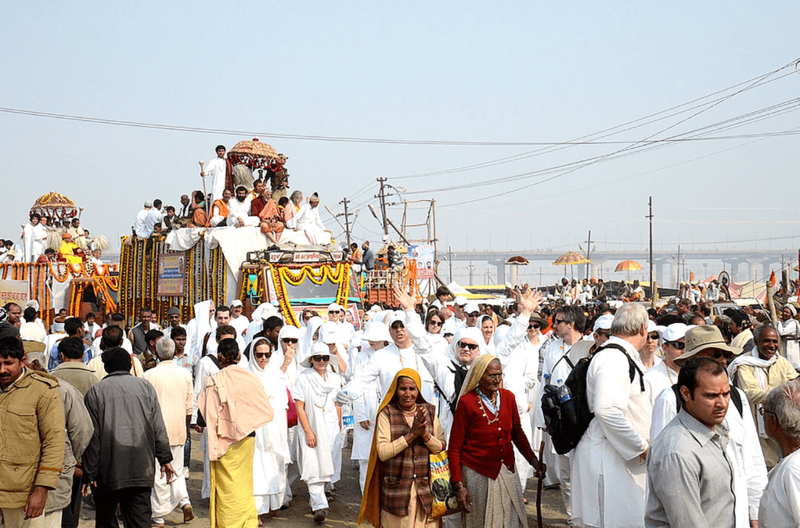 We are walking along the side of the river, separated temporarily from the crowds while headed to our sacred bath in the Ganga with our beloved Sai Maa. The sound of my steps overwhelms the cacophony of all other sound. The world collapses in on itself and there is only this gentle crunching sound. The sound of my feet and the feet of 100 others on this same path together. Suddenly, I am overcome with a powerful expansion in my heart, feeling it move out into space as though opened by a supernova. The entire landscape is lit up, blinding light spreading out from my vision to all things on the horizon, an explosion of pure, absolute bliss. There is no sound, there are no objects, there is no me, or you, or anyone else. There is only light, there is only dissolution into that. And then in a breath, it’s gone. I am back in my body, still walking, still making the same crunching noises on the sandy road, still present to my heart opening and opening, to the point where it emcompasses my entire being. And I’m crying, I’m weeping inside this space of my own heart. I have taken incarnation for THIS. To walk these steps. To be here at this exact moment. My awareness is flooded with the grand design, the alignment of the stars, the movement of galaxies, the souls who agreed to allow me to incarnate, the lifetimes before this one, and how all these things constantly align and re-align in service to the evolution of my own soul. Each and every tiny detail of the massive blueprint orchestrated, calculated to have me in this place in this moment is so clear, so detailed, so obvious—and then it’s gone again. Gratitude floods my entire body. Waves of gratitude. Tears of gratitude. Gratitude pouring out from a me that feels simultaneously far away and not separate, from a me that lived in another time and left things unfinished, from a me that never made it to the banks of this river, never heard the crunching of sandals in the sacred dirt of the Kumbh. The door closed on something that had waited to be fulfilled for centuries, that afternoon on the banks of the Ganga. 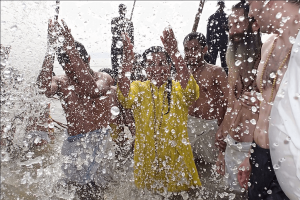 Reaching the bathing place, we all hold hands and jump into the water of the sacred Ganga. Exuberance takes over. 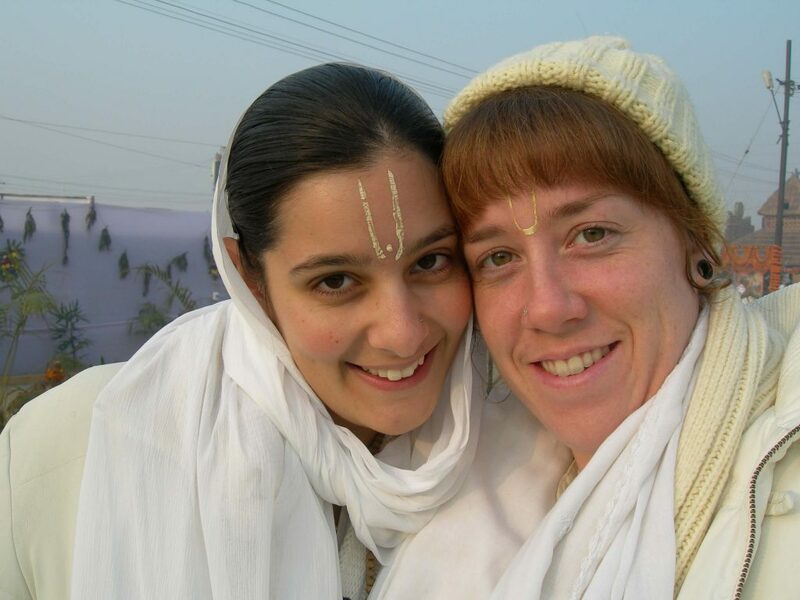 A journey of purification, of fulfillment. A baptism of completion, a baptism of new beginnings.